Where a natural gas pipe exploded due to construction workers disturbing it while working on an excavation project, the Wisconsin Supreme Court held that the resulting bodily injury and property damage was caused by a “pollution condition,” i.e., the escape of the natural gas, and that the contractor’s pollution liability (CPL) policy was required to pay defense and indemnity costs. In Acuity v. Chartis Specialty Ins. Co., 861 N.W.2d 533 (Wis. 2015), Acuity Insurance was the commercial general liability (CGL) insurer for the contractor, and Chartis was the CPL insurer. Acuity defended and indemnified the contractor in four lawsuits seeking recovery for bodily injury and property damage caused by the natural gas-fueled explosion and fire. Acuity then sought recovery from Chartis, asserting that the CPL policy provided coverage for the damages because it was caused by a pollution condition. A Wisconsin appeals court found that an insurer’s duty to defend under a contractors pollution liability (CPL) policy was not triggered by an explosion caused when a contractor hit a natural gas line. The court explained that the CPL policy only covered property damage and personal injury due to direct contact with a contaminant—such as natural gas—not from an explosion due to the leaked contaminant. The case was brought by another insurer (Acuity) that provided the same contractor with a commercial general liability (CGL) policy that did cover damage from the explosion. Based on the decision, the CGL insurer could not require the CPL insurer to share in the costs of defense and indemnification. See Acuity v. Chartis Specialty Ins. Co.,353 Wis. 2d 554, 846 N.W.2d 34 (Wis. App. 2014). Four consolidated lawsuits were brought by several plaintiffs against a contractor, Dorner, Inc., following an explosion that occurred when Dorner employees hit an underground natural gas line. The ruptured line caused an explosion and fire that destroyed a church, damaged nearby houses, and injured two employees of an electric utility company. The contractor had a CPL policy issued by Chartis Specialty Insurance and a CGL policy issued by Acuity. Acuity provided defense and indemnification to the contractor, settling the lawsuits for about $1.5 million, plus defense costs of almost $300,000. However, from the outset, Acuity contended that Chartis was required to share in the defense and indemnification costs under its CPL policy. Chartis denied that its policy was triggered, prompting Acuity’s suit in circuit court against Chartis for breach of the policy. A gas explosion in a San Francisco neighborhood shot flames into the air for hours Wednesday and burned five buildings, sending panicked residents and workers fleeing into the streets. It took utility crews more than two hours to put out the fire after private construction workers cut a natural gas line, igniting the towering flames, Fire Chief Joanne Hayes-White said. Authorities initially said five workers were missing, but the entire construction crew was found safe, and no other injuries were reported. The roof of the sludge concentration building at Chicago’s Calumet Water Reclamation Plant collapsed after an explosion Aug. 30 around 11 a.m. Ten people were hurt and successfully evacuated to area hospitals for treatment by the Chicago Fire Dept. The plant is located in south suburban Riverside and is the oldest of the seven Metropolitan Water Reclamation District of Greater Chicago wastewater treatment facilities. It opened in 1922 and provides wastewater treatment to approximately 1 million homes and businesses in southern Cook County. Kofi Bonner, co-chief operating officer of Five Point Holdings, developer of the Hunters Point Shipyard/Candlestick Point project on and around the site of a former U.S. Navy shipyard in San Francisco, told the San Francisco Chronicle that the project will be delayed for years due to uncertainty around potentially radioactive soil that is scaring off investors and potential homebuyers. Developers still aim to build more than 12,000 homes, 300 acres of parks, offices, schools and retail developments on the site, but many of those plans were stymied after claims that soil tests and cleanup records completed for the property were falsified. Two former employees of Tetra Tech, which was hired to perform the environmental work under a $250 million contract, pleaded guilty to fabricating soil-related documentation and were sentenced to prison. The Navy, which still has possession of the Hunters Point property, with the exception of one section, Parcel A — which was supposedly never exposed to the Navy’s radiological operations at the shipyard — will not release the land to the city or developers until the soil gets the all-clear through retesting. Officials said they will start testing Parcel A as well. Lennar has built approximately 450 homes on Parcel A, where residential construction continues. Bonner said the company will focus on the Candlestick Point portion of the development, where site and utility work is currently underway without the shadow of potentially toxic soil. Approximately 7,200 residential units, 300,000 square feet of commercial development and a 200-room hotel have been approved for the site, according to Bisnow, but the company in April scuttled plans for a 635,000-square-foot shopping mall, citing a downturn in the brick-and-mortar retail market. When most people think of environmental disasters in the San Francisco Bay Area, they almost certainly think of earthquakes, seeing that there are two major fault lines near San Francisco. However, even though earthquakes can wreak immeasurable, unpredictable havoc, they are certainly not always to blame for sending people to hospitals. A contractor struck a six-inch gas main in Hamilton Township, Mercer County on Monday. Calls starting coming in around 1 p.m. for a strong smell of gas in the area of the township known as Five Points. The intersection was closed and traffic was being diverted through the neighborhoods. Chopper 6 was over the scene as workers fixed the main. A construction company hired to build the Mountain Valley Pipeline worked on three similar projects that were cited by environmental regulators, who found mountainsides turned to muddy slopes and streams clogged with sediment. 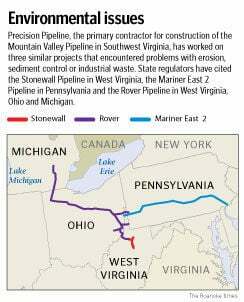 The three developers of the natural gas pipelines, two in West Virginia and one in Pennsylvania, failed to comply with plans to control erosion, sediment or industrial waste, according to enforcement actions taken by state regulators. Precision Pipeline, a Wisconsin company that is a primary contractor for Mountain Valley, played a role in the construction of the earlier projects. Opponents of the Mountain Valley project fear that the pipeline will bring the same problems to Southwest Virginia, which features mountainous terrain similar to that in West Virginia and Pennsylvania where pipelines were built. Those worries were heightened by news that the same contractor will be doing the work. “I have huge concerns about this company being hired,” said Carolyn Reilly, a pipeline opponent who lives along its proposed route in Franklin County. In 2016, the Occupational Safety and Health Administration (“OSHA”) published its final rule lowering the permissible silica exposure level (“PEL”) from 250 µg/m3 to 50 µg/m3. In response, OSHA received petitions from both a collection of industry petitioners (“Industry”) arguing that OSHA made the regulation too stringent and several union petitions (“Unions”) arguing that OSHA failed to make the regulation stringent enough to protect workers. On December 22, 2017, the United States Court of Appeals for the District of Columbia rejected all of the industry’s challenges to the regulation. See N. Am.’s Bldg. Trades Unions v. Occupational Safety & Health Admin., No. 16-1105, 2017 WL 6543858 (D.C. Cir. Dec. 22, 2017). The court further held that OSHA failed to adequately explain its decision to omit medical removal protections from the regulation and remanded the issues for further consideration. Residents of the town of Florida in Montgomery County contacted NewsChannel 13 this week. They’re concerned about a massive Dollar General distribution center being built in their backyards – literally. They told us that in recent weeks they’ve noticed large clouds of white dust over the site and said it’s been blowing onto their properties. They’re worried it could be hazardous and asked us to investigate. The construction site off Route 5S in the town of Florida is a busy one. A parade of trucks and machinery criss-cross the 100-acre parcel seven days a week from dawn to dusk. “They usually start about 7:00 in the morning,” noted Pat Holt. She has a front row seat to all the activity happening a few hundred feet behind her home. She and her neighbors have voiced concerns before, but she says they were assured the impact would be limited. Just a few weeks ago, she noticed big clouds of dust over the site, which she says wound up falling on her property.